I’d like to tell you about something amazing that you can do to improve your health and wellness (hint: it’s not a way of eating, a new supplement or a new exercise fad). Taken for granted too often, there’s a tonne of scientific data that supports and illustrates how being in more natural environments can improve our health in important and measurable ways. As a naturopathic doctor practising in Victoria, BC, I’d say that we are in the best place in Canada to reap the benefits of this. Consider this: An 11-year-study of adults who had identical surgeries to remove their gallbladders. Post-surgery, the patients were put in one of two identical types of rooms. One had a view of a forest, the other looked onto a red brick building. Everything else about the rooms were the same. The patients whose rooms looked onto the forest experienced shorter hospital stays, less post-surgical complaints, used less potent pain medication and had lower negative comments placed in their chart by nurses. This study was one of many presented at last year’s British Columbia Naturopathic Association conference, by Dr. Alan Logan, ND. The lecture was about the idea of nature connectedness and how it relates to health. I found it inspiring and would like to share some more of it with you. Many studies have looked at measurable markers of health such as stress chemicals (eg. cortisol), changes in heart rate, blood pressure, muscular tension, changes in brain waves, inflammation and immune markers in the blood. All of these factors and more are shown to change when people are immersed in nature. Some were actually shown to change just by having people look at pictures of nature scenes! Being in nature can impact our mood, feeling of well being, ability to concentrate and even academic performance. Children who frequently experience natural environments grow up to have less depressive symptoms in adulthood. Walking in a vegetation rich environment in contrast with an urban environment has been associated with better cognitive function in children diagnosed with ADHD as well as lower anxiety in adults. Diversity of plant life has also been associated with better mental health; a green soccer field doesn’t cut it, we need to be surrounded by a richer array of plant life. Being in nature affects our microbiome. That is, the huge array of bacteria living in your body and especially your digestive tract, is imperative to your good health. I was surprised to learn just how much diversity of bacteria western populations may have already lost compared to people who live closer to nature. In one study of people who had limited contact with the western world, 50 percent of the bacteria from their digestive tracts contained unidentified organisms! Another study I found particularly interesting regarded the physical contact with nature. In a two week study, researchers had people rub their hands in a soil-plant based composition three times a day for 20 seconds. Then they washed with water (no soap). After just two weeks this was associated with an increase in gut microbial diversity! As Dr. Logan put it, “Naturopathic doctors are in the business of helping to improve vitality.” Getting into nature regularly is a simple, efficient and scientifically sound way that you can do just that. I hope that by having more focus on nature for our own wellness, we will be driven to consider environmental health more strongly – one cannot exist without the other. 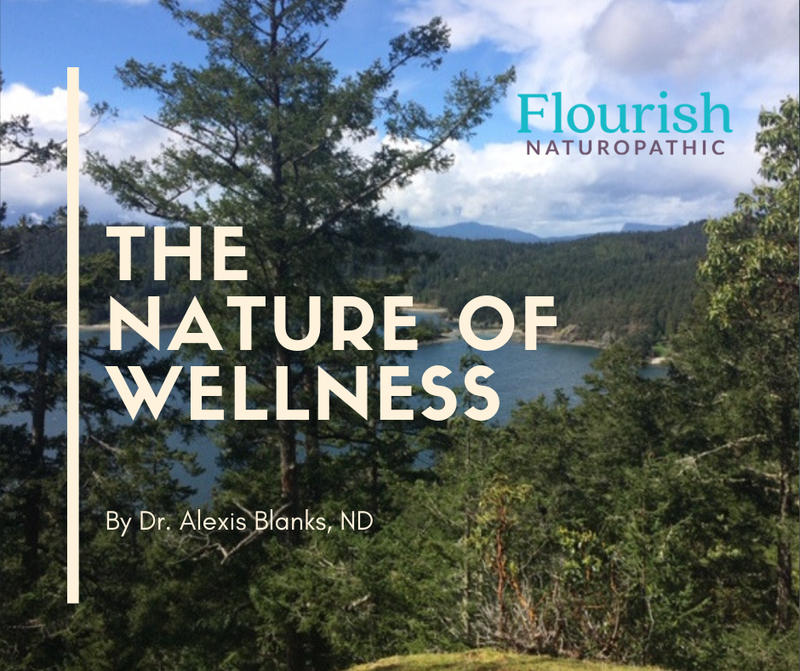 Dr. Alexis Blanks ND is a naturopathic doctor who is clinically trained and naturally focused. She is co-owner of Flourish Naturopathic at Moss Healthcare.